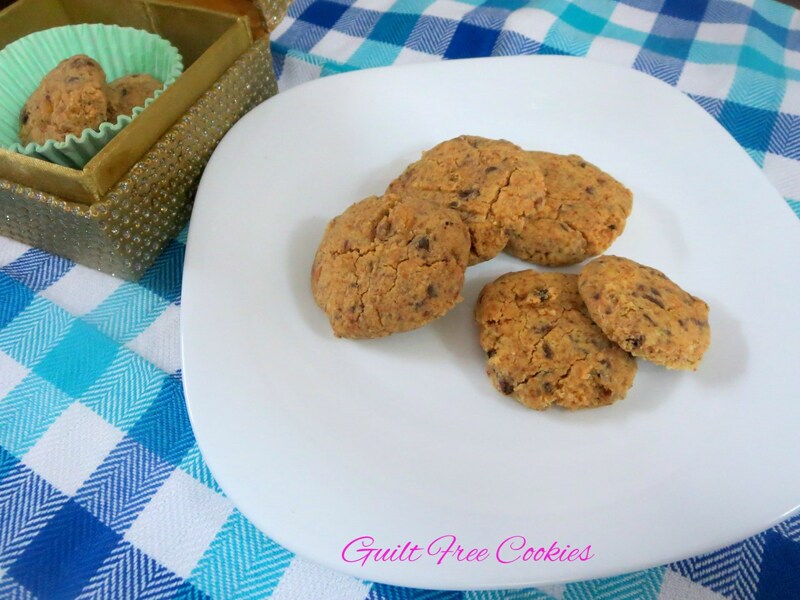 For the final day of guilt free dishes, I have a cookie made with peanut flour and Oats. I know most of you must be thinking that I am still in my Baking Mega BM days, where I had done some peanut butter cookies and some. The peanut Butter chips were sent by Priya Srinivasan and I thoroughly enjoyed it. I even got second helping to the cup and I still have some left out. So I thought the best option was to bake some more cookies. Guilt free Indulgence demands that the same indulgence be done on a less calori way and these cookies fit the bill. Instead of the regular flour, finely ground oats flour is used and replaced with brown sugar. As I said upfront, I am not too much into replacing refined ingredients all the time. When it is possible and makes sense, I do. Moreover I believe as we were fed all these, our kids should have their share of indulgence of everything. Of course in moderation and in the way its healthy. In that sense I hope my attempt at making this series was met. I wanted to try few more recipes, unfortunately with house guest, even sitting to update this has been so tough. Hoping to make them sometime. Until then you got to enjoy these cookies. Roast the peanuts, allow to cool and make the meal. In a bowl take the peanut flour/meal along with oats flour, add brown sugar, butter, baking soda, baking powder, salt and mix everything well. Add more flour if required to get a soft dough. Mix in the bittersweet Chocolate Chips and peanut Butter Chips. Make balls and pinch out small balls. The binding in these cookies are oats and butter. The cookies do tend to be soft to touch. Let it cool down before trying to bake again. On cooling, these do hold their shape. Oh, so you used peanut flour! Reading you post I was wondering in what form the peanuts we're going to be used. ☺️. Cookies look good. Wow, love that addition of peanut flour, cookies looks stunning. Using peanut meal is an awesome idea! 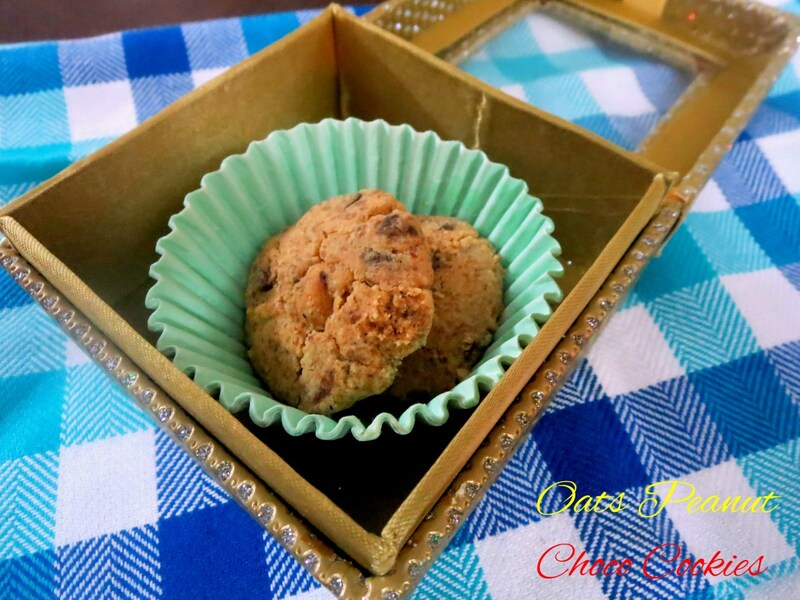 All the peanutty flavor with the peanut chips are sure to make this one yummy treat!!! Again my baking bookmarks seems to increase :). These look very addictive valli. 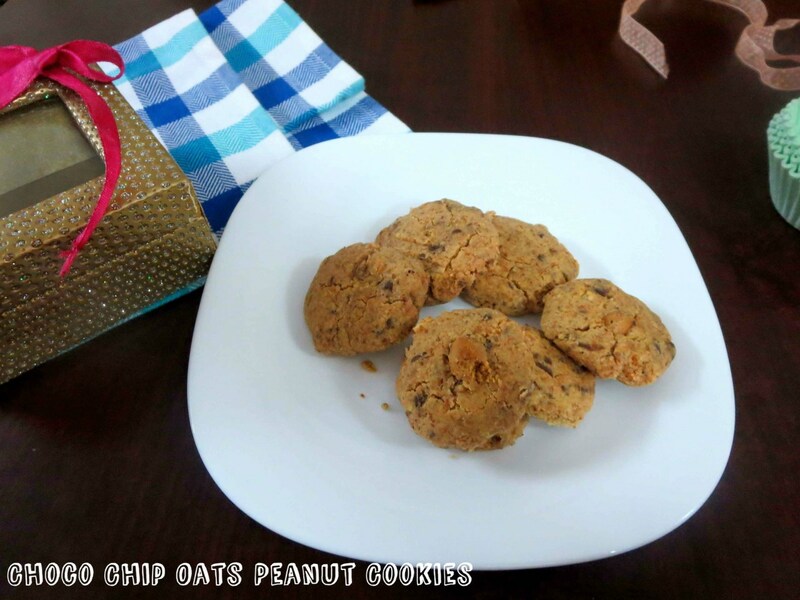 peanut and oats are nice combo..looks great..
Peanut and oats flour is a good substitution for regular flour. The cookies turned out perfect. Using peanut and oat flour instead of maida is a great idea. Peanut cookies turned out great. Peanut flour in cookies sound very interesting. That sure is an interesting version of a cookie. I would have thought of using peanut flour! 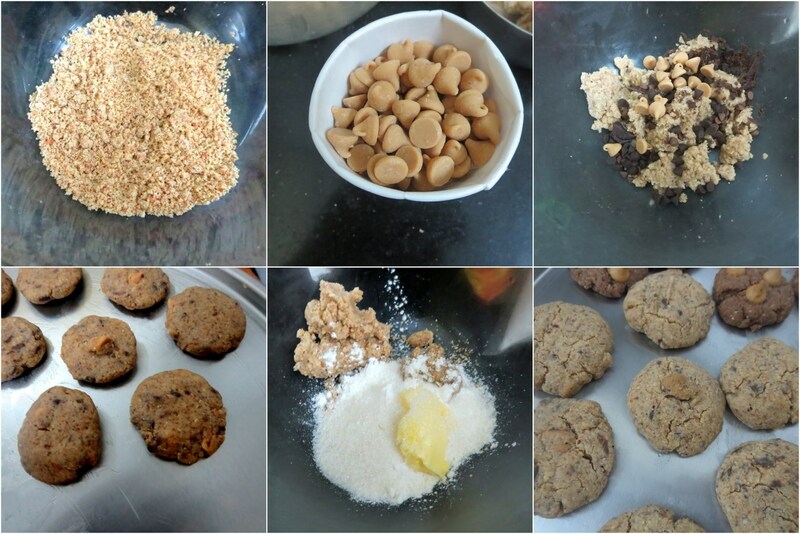 Lovely way to make cookies with peanut and oats flour. Healthy cookies, rich in fiber and protein. Totally nutty cookies!! Looks yumm! !